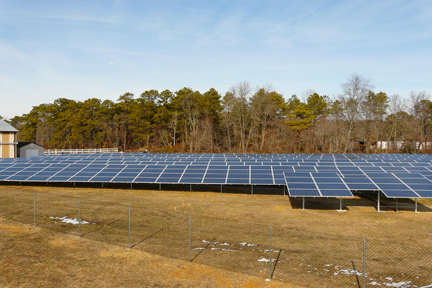 TURNERSVILLE, NJ – SolarWorks NJ, LLC, a leader in designing, managing, and building turnkey solar electricity installations and renewable energy solutions, is proud to announce the completion of a solar installation at B&B Produce in Hammonton, NJ. B&B Produce, Inc. is the first farm in Hammonton, New Jersey to install a large solar energy system. A 224.94 kW ground mount solar energy system was installed over 1.2 acres, and will offset 87% of B&B Produce’s electric usage. The solar array will produce over 266,000 kilowatt hours annually, which is equivalent to planting 30 acres of trees or powering 162 homes. The system consists of 978 Trina 230 Watt Modules with DPW’s Multi Pull Mounts being used as a ground racking system. In addition, the array has a sophisticated monitoring system that receives and stores measured values and data from the inverters. Started back in 1977, B&B Produce, Inc. is located in Hammonton, NJ. Producing everything from yams to Driscoll’s, New Jersey blueberries, they are proud to be an agricultural company on the leading edge of using a renewable energy source. B&B Produce brokers, packs and ships many delectable fruits and vegetables for distribution in North Carolina and other states. B&B Produce believes in giving customers the best quality possible.